We’ve all been there. Your child eats their food, wants to get down, and then they are back two seconds later asking to get up and sit on your lap. Maybe they eat a few bites, get down, come back, eat a few bites, get down, come back (you get the idea). It’s probably driving you crazy and you realize they aren’t doing a very good job eating. This is exactly what happened last week when my niece was visiting me. My sister looked at me and said, “What do I do about this”? This is one of those feeding issues that can interfere with your children doing a good job at meal time. It might start as being cute when they want to sit on your lap to eat, but starts to get old really fast. Without a doubt, when they won’t sit in their seats it interferes with you sitting down and enjoying your own meal. As parents, you are attending to your children all day, you deserve to be able to enjoy our own meals too. But, how do you handle getting rid of these bad habits? 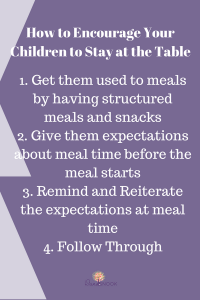 First, I think it is important to acknowledge your children will do best when they learn to have structure around meal and snack time. This means having scheduled, consistent meals and snacks at the table. The more exposure your child gets to sitting at the table and learning to eat, the better at it they will get. 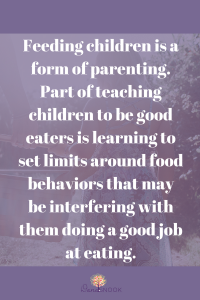 Children need to know and understand what the guidelines around eating time is. Remind your child that it’s meal time – they should fill up and be full because they aren’t eating again until snack or the next meal. Let them know when they choose to get up from the table meal time will be over and they will have to wait until the next scheduled meal or snack time. Hint: I don’t think there is anything wrong with giving a warning. Kids are always learning – the first few nights you do this there is a good chance they will get down before being full. I recommend you warn them – they can get back up, but if they get down meal time is really over. Children, especially young children know when they are full. When they are full they have a sense of exactly when they want to get down from the table. However, it doesn’t mean they won’t try to come back. When your children communicate they are done make sure you ask them if they are sure, and remind them once they are done they can’t come back to eat more. Then let them down. This is the hardest one. Your children will not be happy when you deny them access to the table again. Stay strong – they are testing you to see if you will give in or really stick to what you are saying. It doesn’t take long before they start to get it – or while at the table, or waiting until the next meal or snack. What is the worst part of family meals for you? Do your kids sit at the table to eat?